Sophia – drawing time limit for this was 15 minutes. ‘Twas a usual great night of wine, pizza and drawing tonight at Art Plus, downtown Bundaberg. It’s on once a fortnight, but I missed last week – time gets away sometimes. 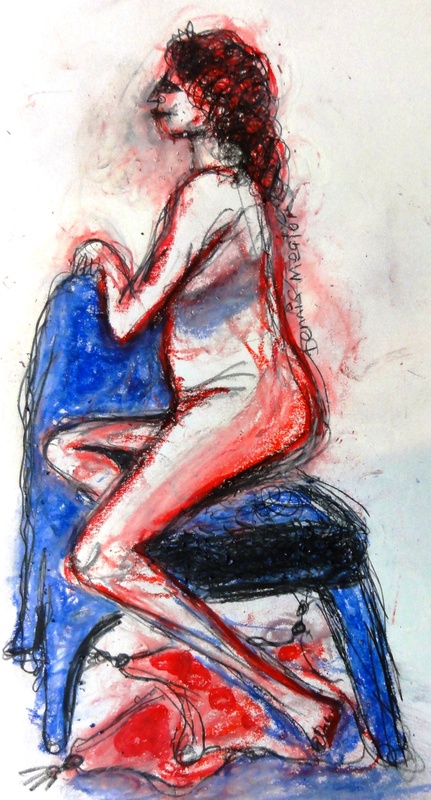 This week was with the beautiful Sophia – Artistically, I never do her justice – but then, my Life Drawing is always in another Universe. Can’t you tell? I keep coming back to oil-pastels & 2B pencil, even though the ‘experts’ at this genre tell me to use stuff like conte and charcoal. But I don’t worry at all – these sessions are my escape from my usual freeform-ish art modes. It is a discipline – yet oddly enough, I always choose to ignore the discipline side of it all – and go rampant with colour and shape. I even imagine that the cushions have tassels on their corners. I like tassels. I want to draw tassels. All sacrilege to the Figure Drawing purists I know. “Draw what you see,” yes, I know. But. It is not about World Famine, or Climate Change. It is just about me, having a good time with my art, and my life. It will suffice. And the World will survive. If you live near the Bundaberg (Australia) area, consider coming along. It is once a fortnight – for 2 hours starting at 6pm Thursdays. You get a model to draw (male or female); pizza at half time; nice red or white wine from a bottle; and good company. Apart from some serious drawing, we have lots of laughs. And no-one need see your work – so it is good for total novices or experienced artists alike. It is untutored, so you just turn up with your art gear and draw in your own way. And all for a mere $12, 6pm to 8pm. If interested, Google Art Plus Bundaberg, and give them a call – they also have all the art gear you will need. See you there, maybe! Cheers, Dennis. © Dennis Mealor – Art Environment. Powered by WordPress and Pyrmont V2.